Just finished making dinner. Like with ingredients combined to create parts of a meal, all together making what most people might call "dinner" or "supper." Here's the thing. I don't cook. Now, mind you, it's not that I *can't* cook, it's that I just simply don't. Why? Because I'm married to man who doesn't eat real food, and I have a daughter who also doesn't eat. And I got tired of cooking for one (me), usually after I had "cooked" for one (him) in the form of mac n' cheese or some such boxed item. SO...therefore, I don't cook. I would be happy to live on Raisin Bran, even a generic. Yeah, that's how far I've fallen. When M is busy or it's just me and Braska, I practically do live on it. Throw in a Slim Fast shake here or there, and I'm good for a long time. I used to cook. Even when I lived alone after college, then when I had a roommate, and even at the very beginning of our marriage, I did actually cook. But when I learned that my husband preferred, yes that's right...preferred Hamburger Helper to homemade dinners, I took the easy way out. It eventually slipped even further, as now HH is a "real dinner," as opposed to things like mini-tacos in the toaster oven, nachos, grilled cheese, and frozen pizza. While you're shaking your head, realize this....he actually LIKES this stuff, at least as much as he likes any food. He doesn't like to eat anything, really. He says that eating is a hassle, and he's jealous of Braska's ability to receive sustenance without putting forth effort. He even talked of seeing what it would cost to do an elective g-tube. Yeah, crazy, I know. He likes turkey, if it's pulled/shredded and dried out about 10 minutes then salted. He will eat lasagna sometimes, tacos usually, chili occasionally, and chicken bits here and there, that's chicken breasts cut into small pieces or pulled then cooked again with seasoning until they're pretty dry. The hard part, really, is this... even food he "likes" are not always acceptable. Like tacos could be considered a favorite, but it is possible for me to have all veggies chopped, meat seasoned, and shells warmed and he'll walk in from work and not want tacos. Or I could make homemeade lasagna, one of my best offerings, which he does like, but after spending all the time to make sauces and layer and such, it wouldn't be a surprise if he didn't feel like lasagna that night. SO in order to avoid such things, I've just gotten in a pattern of not planning at all. That's hard for me, as I am WAY a planner. Dinner time is the old college style "what do you want, I don't know, what do YOU want" kind of thing. Then I stand and look at a bare fridge and sparse pantry and give him options of mini-ravioli, beef ramen (which he actually CHOOSES sometimes), or popcorn. It's a sad place we've come to, but he really doesn't mind. I, on the other hand, have fantasies about dinner time. Meals planned out ahead of time so that I can order my day appropriately and shop more efficiently. It's when we set a crock pot of beef roast and veggies on the table with rolls and salad. We sit down and chat about whatever comes to mind, things of the day, what's new with the kiddo. It's comfortable and relaxed. Even after 10 years, I still have that dream. Is it any wonder that we have a child with feeding issues? I don't think it's a coincidence...and the speech/feeding therapists that we've seen don't either. They keep trying to get us to sit at the table and include Braska. But our dining room is generally just a walkway from the hall to the kitchen. I keep thinking I'll do it with her, just us two, even if it's not a group thing, but I haven't. It's just easier to stick with the norm...catching up on DVR shows while I eat off a TV tray and he eats at his computer across the room. We're not eating the same things, so we don't usually even eat at the same time....well, sometimes that works out. Braska usually is already done with her 5 minute straight-to-the-belly dinner before we start. Then I fix whatever he's eating, then I decide what I'm going to eat and I make it. Wow...didn't mean for this to become all about our eating, but it is kind of interesting, or pathetic maybe. We admit it. We're not deluded into thinking this is the right way, it's just survival on my part, and it pretty much the way he's always known. So anyway...back to tonight. I have been very upset at the state of things and how bad they've gotten. Our house is trashed, like the worst it's ever been. This is completely unacceptable to me, but thankfully in a way, M doesn't mind. He never says a word about it... so at least I'm not being hounded. That's a good thing. But I don't like it. I don't like that we've been doing take-out too often, that we haven't been actually eating food, non-boxed. So today, after a frustrating therapy session that made me feel like I would NEVER get things right (not the therapists fault, she's good), I decided that I was going to get something accomplished today. So I started with the kitchen. I always start there. It's the one place I can dig into and actually finish. And when it's done, it looks so great. Since I had a clean kitchen, I was more in the mood to put forth an effort to make something. So I decided on chicken, rice, and salad. This is on the "usually" list of acceptable things. We haven't had it in a while, so that makes it a better bet. I went through the process of the chicken (thawing, dicing, cooking, seasoning, cooking more until dry) then I saw an onion. This is rare because I don't usually buy produce because it always goes bad. M hates onions, so I got an idea. Why I thought of this, I do not know. I decided I'd make my own onion rings. I LOVE onion rings. I don't remember why I bought this onion, but who cares. I did a quick web search for batter recipes and there I went. I managed to keep an eye on the chicken, start the rice, chop the salad veggies, make the onion batter, slice the onions, and get them in the oil all in stride. Man, they were good!!!! Check out how pretty they are! In the end, M had a nice dinner of chicken bits, rice, and salad, followed by vanilla ice cream. I had part of a chicken breast, tomato, and onion rings! Now that's dinner! I'll hold onto my dinner dream. Someday I may get there, but I'll not hold my breath. Raisin Bran will continue to be my friend, but at least for today, I accomplished a few things that made me proud. Yeah for you! Those rings DO look mighty tasty too. You can come plan dinners for us. V used to cook these really tasty meals - but we seem to have lost our steam and are so tired by the time dinner rolls around. Man, I'm exhausted just reading all of that. How on earth do you keep up with all the particularities? But I agree with everyone...really nice onion rings. Very ambitious! Hope you enjoyed them. 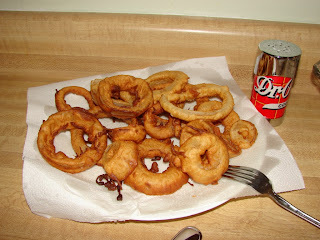 WOW, onion rings! You almost made me drool on my keyboard! I'm proud of you, Honey! Why not make up some of your dream dinners, package them up in individual servings, and freeze them. Then when you or M thinks something sounds good, you just pop it into the micro and you've got it made. You can do it! Karen K--I'll send him to your house for dinner tomorrow! Jen-Silly this is how I celebrate, huh? Melissa-You always seem to have a menu plan! I've been oft impressed by your neato meal list! Jen--It's quite the job, let me tell you. And I'm not always pleasant about it. Mom--My freezer is generally full of things like pizza rolls, ice cream, frozen chicken, hamburger, etc. It's not a very big freezer. Not that I'd actually work ahead like that anyway.